The wisest things ever said about chess. Type: BOOKS. Detail: Soltis, A. Product Code: 9781906388003. The Wisest Things Ever Said About Chess is the title of a book written by Andrew Soltis. 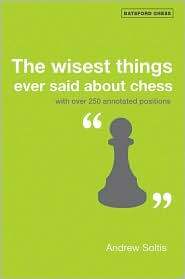 If you enjoy chess quotes and maxims you'll find this book interesting. There are 288 if them and Soltis has something to say about each of them plus a diagram for each. Here is one example: "One should never prevent one's opponent from making weak moves." Soltis says it is an echo of Napolen's "Never interfer with your enemy when hs is detroying himself." Soltis uses the game between Morozevich Topalov FIDE World Championship, 2005 for his illustration and comment.